I want to take this as a starting point, to think about the topic of „informal“ documentation. What does informality mean in relation to documentation, what does distinct „informal documentation“ from other approaches? Therefore I will focus on the documentation of „media art“. This post will set the stage to further delve into the topic. Documentation can first and foremost be seen as translation. It translates a project into data about the project and meta-data, which on the one hand describes the data but also further contextualizes the project, or in short into information. But it is also a translation into another medium (chosen for documentation), into other modalities. This is following the definition of remediation of J. David Bolter and Richard Grusin (1996 & 1999) as „representation of one medium in another“ (Bolter & Grusin 1996, 339), which for them is a characteristic of digital media. But it has to be noted that this translation process of an art project into an archivable format comes with a loss of the information of space, temporal components, interactivity, potential as well as actual user-experience. 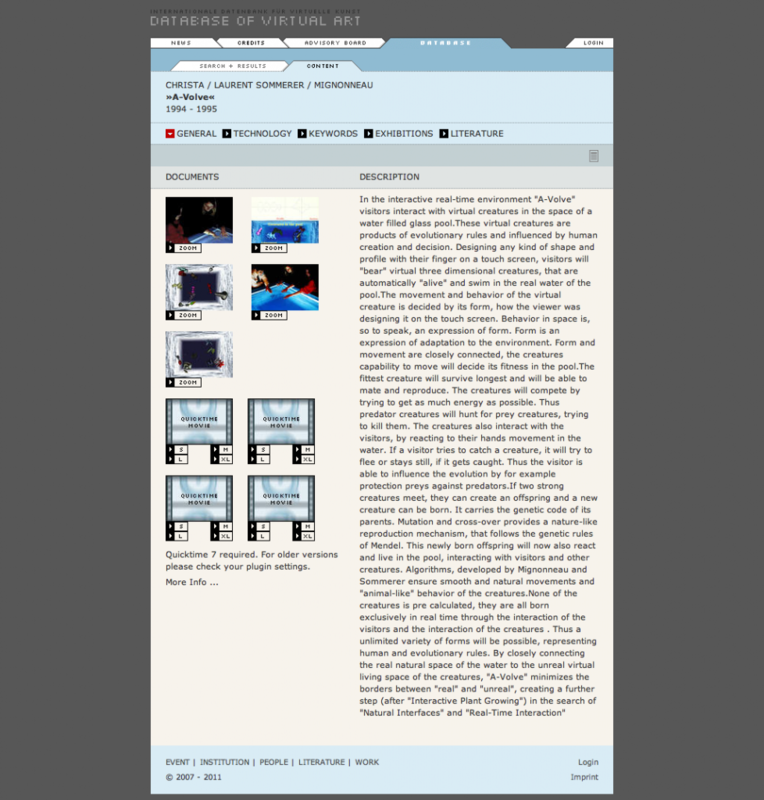 Alain Depocas argues in his text „Digital preservation: recording the recoding“ (2001), that documentation is mainly about contextualizing the artwork. Only through enrichment and linkage of the data about an art project with additional illustrative material „for thematic connectivity and possible discursive linkages, i.e. to place it in a context on the Internet itself“ (Stemmrich 2005, 48), a deeper understanding of the project is possible. Basic context levels are for example the production or reception context of a project (see e.g. Müller 2008), other context levels might be added depending on where the documentation of the work appears. If it appears for example in a database, the other material in that database contextualizes the documentation and influences the interpretation of the material. If the database is accessible online, the Internet itself contextualizes the database, as well as search results – be it based on content analysis, meta-data, semantic relations – in which the data appears, provide a temporal context for the data. In short the software used to access and display the documentation plays an important role in the meaningmaking of the work. Understanding an artwork just through a description of its formal character is merely impossible. Moreover a documentation can be seen as a representation of an art project. „[T]he artwork and its documentation are inseparable. Indeed, they are two faces of the same coin” (Depocas 2001). Following Boris Groys, a documentation of art is „per definitionem not art, it only refers to the art and makes clear that the art is not present and immediately perceivable anymore, but rather absent and hidden“ (Groys 2003, 146, translated by the author). But if one takes the word „representation“ seriously, it is also a another presentation of a project, in a translated form and in another kind of display. It enables ideally a meta-encounter with the art project. Moreover it inscribes the project and its existence into history (cf. Groys 2003, 152). Jean-Marc Poinsot describes the task of a documentation of ephemeral works, which include besides process oriented works also performative works, as embodiment of memory of the project until its re-realization. Therefore a similarity to a musical score is evident, which can be described as formalization or an abstraction of an art projects, representing different projects in the same formal language. virtualart.at uses an extended notion of documentation. „The traditional concepts of art and documentation were substantially oriented towards the work as an object and harmonized in large parts with static documentation models, whereas the works of contemporary art today are processual, ephemeral, multi medial, interactive and essentially dependent on the context. Because of this fundamentally different structure they need a modified, an extended notion of documentation“ (Grau, 2004, translated by author). Oliver Grau’s documentation concept does not only include conventional core data about a work, such as artist’s names, title, year or description, but also technical configuration, interface design, software, visual displays, inventions of artists, graphics of the installation setup, interviews and reports by visitors, information about technical staff, institutions of media art, digital visual documents, as well as awards. Therewith technology is recognized as an important component of the work. But also the exhibition contexts of a project, publications about it as well as (audio)visual documentation material contribute to the contextualization of the project. Moreover virtualart.at uses a standardized thesaurus for describing and categorizing the projects, which formalizes the projects and reduces them to certain formal characters regarding aesthetics, genre, topics and technology. The goal of the project virtualart.at is to „provide an overview of the rapid development in the area of virtual art and all its sub-genres and to contribute to its preservation“ (Grau 2004, translated by the author).Therefore the conceptual approach aims to document the work within the context of complex information while allowing quick access to granular data. „Beyond static, quantifying analysis and technical documentation the database should enable the depiction of personal relations and economic data, which – so the idea – expose interests and dependencies“ (Grau 2004, translated by the author), allowing for example conclusions about gender, movement of technical staff between labs, art-technical inventions, streams of public and private research funds, reminiscences of Virtual Art to other media forms and their predecessors. In other words the database of richly interlinked data should allow to paint a bigger picture about the field of virtual art. „[…] documentation is altered from a passive archiving of core data to a global interdisciplinary and actively devised process of knowledge transfer“ (Grau 2004, translated by the author). The data is aggregated by experts of the field in cooperation with established media artists, researchers and institutions. The „Capturing Unstable Media Conceptual Model“ (CMCM) was developed by V2_ Institute for the Unstable Media, Rotterdam, NL as a conceptual model for documenting and describing „electronic art activities in a generic way, by using a structure of typical concepts“ (Fauconnier & Frommé 2003a) – a concept defining one specific (abstract) entity, which can be used for capturing the art project (e.g. project, component, person), which can be further described by attributes. Therewith CMCM is an ontology derived from studying projects in the V2_ archive, building up a object-relation structure of core concepts about electronic art projects, describing their interdependencies within the project, from production to reception, which can be used to document an electronic art project as process, taking amongst others into account the nature of distributed authorship of a project, technical behavior of components and more. This abstract model presents a standardized instrument, which should allow a variety of institutions to use it, ensuring comparability of descriptions, of exchangability of data and therewith ideally archival interoperability of institutions. Richard Rinehart proposed a notation system for media art inspired by the idea of a musical score, which should allow the reinterpretation of an artistic project. A notation should take the character of a media art project as activity or event into account, and „should be able to describe the work as set of parameters manifested as a product or occurrence“ (Rinehart 2007, 183). For his implementation Rinehart describes three levels of implementation: 1) the record of the work, 2) the machine-processable representation of the work and 3) the machine-processable model / manifestation of the work. Rinehart sees this score as „media-independent logical backbone for the Work that relies on the original files to provide detailed functionality and appearance. This feasible level of implementation would create an interoperable record of the work, a guide to re-creation, and a way to maintain the integrity and cohesion of complex works into the future“ (Rinehart 2007, 187). This system hints to another important point in terms of standardization, namely the machine-readability / processability of information, which is tantamount for current trends towards a „semantic web“, which ideally would enable more complex, meaning-based queries, which require a semantic „understanding“ of the data. On the one hand there exists the desire to fixate the core of the work, to make it objectively analyzable, comparable and readable.This notion of fixation is not unproblematic, because how do you capture something which is ephemeral and constantly evolving without creating only a snap-shot in time, a momentum out of the project? Also the notion that one could potentially grasp and describe a project objectively, which is based on subjective experience and action of the user, is questionable. Going back to Dieter Daniels (2004), a experience based work can only be described subjectively from a point of view of a particular role, which the author of the description had in the project (cf. also Stemmrich 2005). Moreover Daniels notes, that a textual description can never replace a direct experience. The impossibility of an objective point of view challenges moreover the model of a master narrative or an expert view on the work. Rather multiple subjective points of view and subjective personal expressions – capturing individual experiences – are needed to make sense of the artistic project in a process of collaborative meaning making. On the other hand a score can serve as starting point for re-interpretation of a project and therewith a starting point for an ongoing process, which makes a deeper engagement with the project and its possible experience and even a re-experience possible. This calls for a transformation rather than a translation of media artworks. These thoughts lead me to the idea of „informal documentation“, which strengthens the importance of the experience of an art project, leading back to the thought put forward in the editorial of this exhibition, that what matters in an artwork are not so much its formal attributes, but what happens between the project and the visitor. This „inbetween“, which in my opinion is a very important aspect also for art mediation, needs to be captured. Alain Depocas (2001) calls to „[c]reate documentation that is open, collaborative, living and updateable in the image of the new media themselves.“ „Documentation on new media art must not be a mere illustration, but rather an interpretation, an attitude. To reflect this attitude, the documentation must adopt a structure similar to its subject’s“ (Depocas 2001). In a way this is a call for a distributed, living information space that is open to artistic interference – a space for exchange, collaborative creation and presentation and personal expression that is both permanent and flexible. One important quality of informal documentation is subjectivity of the documentation, capturing either a subjective experience, a personal interpretation, which in sum with other individual points of view can lead up to a broader image of an art project, as well as a personal expression about the project. There are different mechanisms of subjectivity at work, when it comes to documentation: one can be a human subjective interpretation, an individual expression of experience. But also technology is acting as an important agent in documentation, which has its own subjective point of view. Each technology has its limitations what it can capture. It never delivers a 1:1 copy of whatever it is capturing, always leaving out information. Most apparent are these losses once errors or glitches occur. Moreover the technology captures data according to the point of view of the user, where human subjectivity comes into play again. Subjectivity allows interpretation in a documentation, strengthening its speculative nature and making clear the uncertainties and assumptions the documentarist made when creating the documentation. Usually informal documentation follow a case specific approach, where the methods of capturing and the way, certain aspects of the work are captured, are not (completely) standardized, which allows for a reaction to specific needs in capturing the essence of a work. The informal documentation approach also doesn’t restrict the authorship to a small group of experts, but rather opens it up to all interest groups who want to participate and contribute their point of view, from visitors and students to researchers and artists. It moreover is open for the interaction between the different interest groups, which can create a broader discourse about a work and has the potential to democratize the documentation by ideally involving the critical mass into the meaning making process. One project, which follows this paradigm, is „Botaniq“ an „Archive of experiences with Media Art“. The project, initiated by Gabriel Vanegas, a media artist and researcher, „is a media art database made by a community which explores ways to archiving contemporary art based on their own experiences, based on their own personal diaries“ (Vanegas 2010). Vanegas compares the questions raised with the documentation of media art with the challenges, the conquerors of America faced in the 16th century: how to show all the species found on the other continent to the people in Europe without having the ability to bring them over on the long ship? How to preserve for example the taste of a pine apple? The only way was „to keep the spirit, the essence and the reinterpretation of what they saw based on their own experience“ (Vanegas 2011). „[…] the notations and the diaries of the members of the expeditions went from being just a documentation or a copy to become the reality itself“ (Vanegas 2010). In the same spirit Botaniq is exploring documentation of contemporary media art works through visitors, who, as witnesses, express their own experiences in a creative way in a personal diary, which presents the project through a subjective description of a specific moment in time of the art project. The interpretation is influenced by the background of the documenter as well as by the journey through the exhibition, which is usually the starting point, before choosing a specific work. These documentations are usually produced in workshops held in a specific exhibition or an art event, where each participant is responsible for documenting a specific work. The participant can use any medium to express his or her experience creatively. The diary entries contain a description of the work as the visitor encountered it, of sensations while experiencing the work – for example the soundscape in the room or movement – and thoughts the work triggered while encountering it. Oftentimes the first encounter of a work is influenced by the journey through the exhibition, triggered by a certain point of attraction, which also reflects back into the diary-entry. The documentation is done either in English or in the mother-tongue of the person documenting the work, which adds another subjective and personal component to it. The documentations use all kinds of creative modes of expression beyond a mere description – starting from the use of the general layout, typography, illustrations, photography, video (either self produced or found footage), collages and mixed media, to create a notation of the art projects and convey a mental representation of their personal experience. Isabella Haaf, for example, transforms an aspect of the work in her notation of „A-Volve“ (1994) by Christa Sommerer and Laurent Mignonneau into an analogue representation of the basin, where the user of the analogue documentation could playfully reenact part of the art project, where creatures, who were created based on shapes drawn by the visitors, interact in a water basin and can be influenced by the actions of the visitors. The documentations are compiled in an encyclopaedic physical publication and a digital version, which is uploaded to the Botaniq-website, which allows to explore the work of art through its reinterpretation. These documentations in themselves open up interesting questions on remediation, as they are translations of the projects into another artistic expression, but also work with remediation in the sense of Bolter and Grusin (1999 & 1996). For example in Stephanie Sarah Lauke’s documentation of „One Hundred and Eight“ (2010) by Nils Völker the material sample is only hapticly accessible in the analogue representation, whereas in the digital version it is reduced to an image, while the silent video she produced is only accessible in the digital version, and was transformed into a number of film stills chosen by the documentarist, which should represent the video in the analogue version. The same happens for the „interactive“ part of Isabella Haaf’s documentation, which in the digital version becomes a photograph showing potential interaction, and therewith is itself a documentation of the documentation. „Botaniq preserves art across notations, synthesis of the experiences of the unknown observer and interactor, as a form of spiritual communion, where the notation of the artistic experience becomes the work of art itself“ (Vanegas 2010). Through a workshop format, open to be conducted by anyone, as long the results feed back into the Botaniq-website, the community can become a place where potentially anybody interested can become part of the meaning-making process of media art and can contribute his experience, but it can also become a tool for art institutions to archive their exhibitions in realtime together with their visitors. After setting the stage for „informal documentation“ in this post, I will further explore aspects of the topic in later posts. Bolter, J. D., & Grusin, R. (1999). Remediation – Understanding New Media. Cambridge Mass., London, England: MIT Press. Daniels, D. (2004). Das Vermittlungsparadox der Medienkunst – Thesen und Modelle zur multimedialen Vermittlung. In G. J. Lischka & P.
Weibel (Eds. ), Die Medien der Kunst – die Kunst der Medien (pp. 90-104). Wabern, Bern: Benteli. Mulder, A. (2007). The Exercise of Interactive Art. In J. Brouwer & A. Mulder (Eds. ), Interact or Die (pp. 52-69). Rotterdam: V2 Pub./NAi Publishers. Paul, C. (2007). Myth of immateriality: Presenting and Preserving New Media. In O. Grau (Ed. ), MediaArtHistories (pp. 251-274). Cambridge Mass., London, England: MIT Press. Stemmrich, G. (2005). Media Art Net – A Paradigm for Media Art Mediation. in: Frieling,R. ; Daniels, D. (Eds.) (2005). Medien Kunst Netz 2 – Thematische Schwerpunkte. Wien, New York. Wiencek, F. (2009). Gedanken zur Online-Vermittlung von Medienkunst. In A. Rotert, H. Nöring, & R. Sausmikat (Eds. ), Katalog des European Media Art Festival Osnabrück 2009 (pp. 216-217). Osnabrück. This entry was posted on Friday, May 18th, 2012 at 9:50 am and is filed under INFORMAL. You can follow any responses to this entry through the RSS 2.0 feed. You can leave a response, or trackback from your own site.